For adult children and spouses trying to care for a senior loved one with Alzheimer’s, wandering can be a frightening and difficult behavior to manage. Because people with the disease can often go for long periods of time without sleeping, weary caregivers struggle to find ways to keep them safe. While scientists haven’t been able to pinpoint an exact cause of wandering, there are some circumstances they believe may be triggers. In general, researchers believe wandering is linked to overstimulation and unmet needs. Because people with Alzheimer’s often lack verbal communications skills, they are unable to express what is wrong. It can lead them to head out to try to find their own solution or to find their way back to a place they consider home. Hunger or Thirst: Because a person with Alzheimer’s disease might not be able to recognize or verbalize these needs, it is important to offer them food and water at regular intervals. Bathroom Reminders: Another trigger for wandering may be the need to use the bathroom. Because they might not recognize their surroundings and be able to find the bathroom, they may wander. Make it part of your routine to show them the bathroom in case they need to use it. Agitation: A hectic or noisy environment is difficult for someone with this disease to process. It can cause them to become agitated and try to find an exit. Being over tired can also increase agitation. Having a quiet place for them to retreat to or a pathway they can safely pace indoors may help calm them and prevent them from trying to leave. Change in Environment: As Alzheimer’s disease progresses, a person’s environment may look foreign to them. They may try to find their way back to a childhood home or environment thinking it is their real home. Keeping coats, boots and keys and other leaving cues away from exterior doors could keep them from recognizing they are exits. Installing sliding locks near the top of exterior doors may also help. Placing “STOP” signs on doors you don’t want them to use can also be a deterrent. Most people with Alzheimer’s will be able to recognize this simple command even in the more advanced stages of the disease. Researchers estimate that 60% of people with Alzheimer’s will wander at some point. There are proactive measures you can take to help you prepare for the worst. Create an Alzheimer’s Wandering Kit. 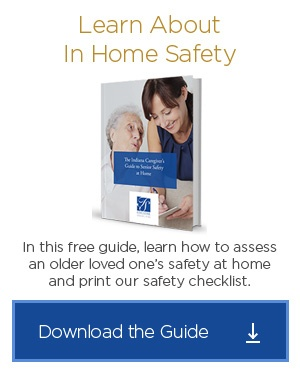 Having one is the best and fastest way to get local first responders the information they need to find your senior loved one. Utilize the Alzheimer’s Association Safe Return program or a GPS tracking system. There are a variety of low-tech and high-tech safety programs designed for people with Alzheimer’s disease or a related form of dementia. We hope these tips give you a better understanding of what causes wandering and helps you find ways to prevent and manage it. Can Berries Help Prevent Alzheimer’s Disease? Can Alzheimer’s Really be a Form of Diabetes? Is a Personality Change an Early Sign of Alzheimer’s?